1. In an oven safe baking dish, whisk together the olive oil, lime zest, lime juice, garlic and season with salt and pepper. 2. Place salmon into dish and give them a swirl to fully coat. Let marinate at least an hour, flipping half way through. 3. Once you are almost done marinating, preheat the oven to 425°. Cook salmon in oven for 10-12 minutes or until flaky. Keep warm. 1. In a medium bowl, combine mango, pepper, cilantro, red onion, avocado, lime juice, olive oil, and coconut water. 2. Season with salt and pepper and place in fridge. 1. If you haven't already, rice your cauliflower in a food processor or high speed blender. 2. Heat olive oil in a skillet over medium heat. Once warm, add in the riced cauliflower and cook for 5 minutes. 3. Stir in the coconut milk, shredded coconut, and 3 TSP lime juice and bring mixture to a low boil. 4. Reduce heat to low and let simmer for 10 minutes, or until most of the moisture is absorbed. 5. Stir in the remaining lime juice, lime zest, and fresh cilantro. Cook until everything is heated and most of the lime juice is absorbed. 1. Place coconut cauli-rice onto desired serving dish. 2. 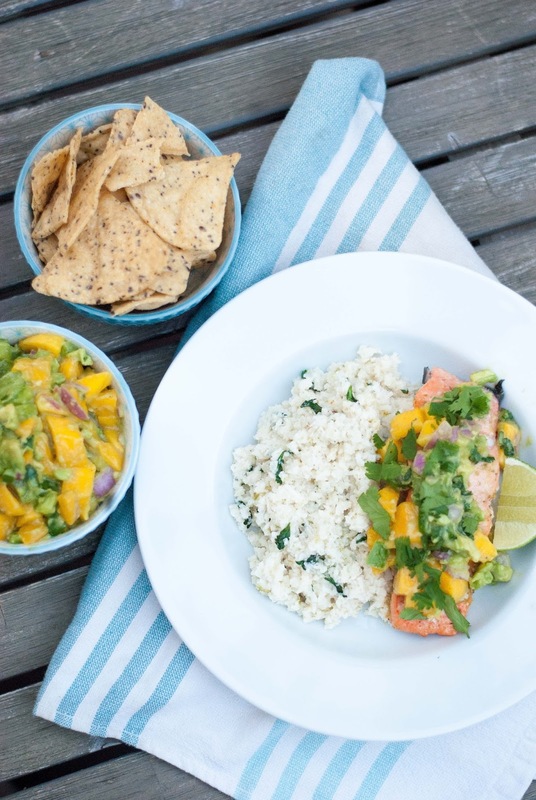 Top with salmon and then mango avocado salsa. 3. Garnish with fresh cilantro and a lime wedge. Enjoy!